Sign pointing microfilm users to different online resources. Taken in Wilson Library’s North Carolina Collection Reading Room, UNC-Chapel Hill. Newspaper digitization is challenging for a number of reasons (refer to our previous post). Although we’re biased, if you’re interested in accessing North Carolina newspapers online you’re actually pretty lucky; North Carolina is positioned well ahead of many other states. Below we’ve listed, in descending order of size, all of the major historic online newspaper databases sponsored by North Carolina institutions that are on our radar. Details: The North Carolina Collection at UNC-Chapel Hill Library recently partnered with Newspapers.com to digitize millions of pages of North Carolina newspapers. These are accessible for free at the State Archives of North Carolina or UNC-Chapel Hill’s Library, or you can view them anywhere at newspapers.com for a monthly fee. As of July 2017, NC LIVE also makes these papers available to member libraries and their card holders. While there are other vendors out there with historic North Carolina newspapers, this is the most comprehensive to date. Details: Each year we receive LSTA funding from the State Library of North Carolina to digitize newspapers. Part of that funding goes toward papers on microfilm, for which we ask for title nominations from libraries and archives. We also digitize some newspapers from print (mostly college and university student newspapers) as well as small runs of community papers that have not been microfilmed. Details: UNC-Chapel Hill is currently in its second round of providing selected historic newspapers for digitization and sharing through the Library of Congress’ Chronicling America website. These issues are searchable along with a selection of titles from other states. Details: The Greensboro Historical Newspapers collection includes a variety of papers from that area, including World War II military base papers. Details: The State Archives of North Carolina actively preserves, microfilms, and digitizes newspapers. While most of these are not currently available online, they have shared some of the earliest on their website. Details: ECU’s Digital Collections include The Eastern Reflector, a community paper published in Greenville. UNCG’s The Carolinian (1919-the present). This isn’t to say others aren’t scanning their local newspapers – we know some heard of local entities (businesses and libraries) working toward that goal. But this post was intended to list the largest, statewide, and (mostly) freely searchable endeavors. Know of others? Tell us. In Part 3 of this Newspaper Digitization series, we’ll get technical and describe how we digitize newspapers here at the Digital Heritage Center. Looking for a newspaper that isn’t online (yet)? Through your local public library, you can most likely loan and view newspaper microfilm from the State Library of North Carolina. This Newspaper Locator may be helpful if you want to determine some of the titles published in a specific area. North Carolinians are heavily involved in efforts to preserve born-digital news. The Educopia Institute, located in Greensboro, is spearheading a conversation that brings in news producers and cultural heritage professionals to talk about our disappearing journalistic heritage. At their website you can learn more about the Memory Hole events and read a white paper on Newspaper Preservation. 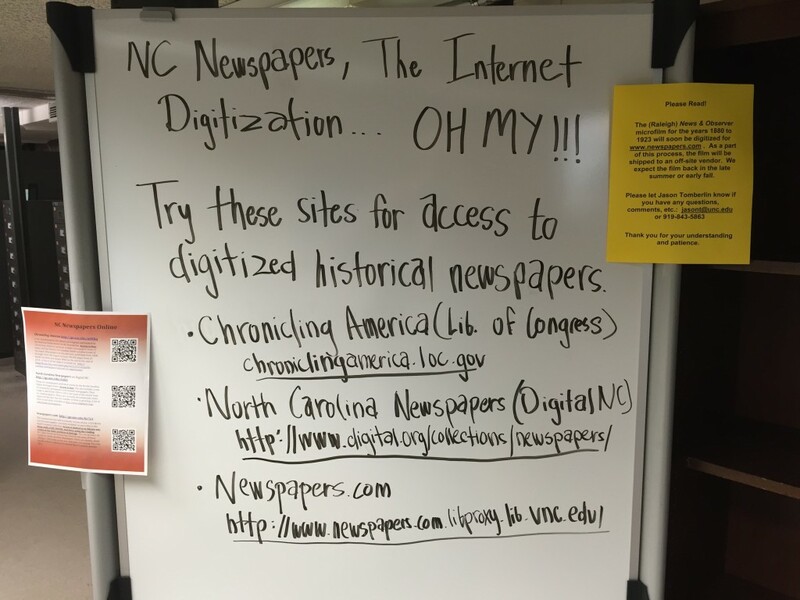 ← North Carolina Newspaper Digitization Part 1: Why Isn’t It All Online Already?